Our new content building tools have enabled our customers to make some amazing websites. Along with the templates that are being added and our new header and footer options, it’s now the perfect time to give your website a makeover and try out some of the newest features that we have on offer. I asked the Create team what of our new features were their favourite, and have put together a list of 8 new things that you need to try, recommended by Create Staff. So, head over to your own Create account and give them a go! If you use one of our new templates, you get access to our new header and footer features. There are now a range of different options for both your header and your footer, so you can choose whichever style suits you. You can even include your social links and phone number in your header! You can choose the layout of your header and footer underneath the template selection area of the Design Studio. Click on either the ‘Header’ or ‘Footer’ option to see what you can pick from. There are so many varieties of both the header and footer to choose from and you can preview exactly how they will fit on your site. Check out our Editing Headers and Footers Help Guide to see how easy it is to add them for yourself! Branding is such a huge part of a business and your website. Making sure that your logo is memorable and recognisable is really important. If you choose to have an image as your logo, we’ve removed the size restrictions that were previously in place. (N.B. Compatible with a new header, footer and template). No matter if your logo is portrait, landscape or even a perfect square, our system will adapt so that your logo will be displayed at it’s best. Click on the ‘Header’ option in your Design Studio. (Get there by clicking ‘Design’ in the top menu of your Create account’ and then ‘Design’ in the left-hand menu). Then it’s a simple matter of hovering your mouse over your existing text or image logo and uploading your new image! For a detailed guide on how to edit your logo, check out the ‘Website Name And Logo’ section of this Help Guide. Using an eye-catching Full Width image can really help you make a statement to the visitors of your website. You can use your amazing imagery to its full advantages, by showing off your products or service in a way that makes them unmissable. 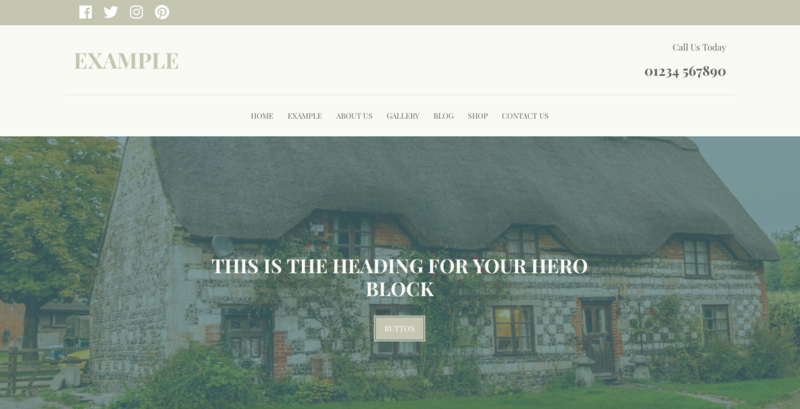 This works especially well with our Hero Block - add a header over the top and a call to action by including a button to really engage with your visitors. One of the best features you can have on a Full Width Image is our Parallax feature, which you can read about below. Using the Parallax feature on a Full Width Image block, can really help your website to pop. Parallax turns your static image into a scrolling image, meaning as you scroll down the website the image moves with you! We’ve seen customers use this to really showcase their products and services and by changing the padding, or spacing, of a block you can truly make your website unique. To turn it on, just toggle the switch located in the Image Settings for the Full Width Image you’ve chosen. Check out our Inspiration Site homepage to see Parallax in action and you can see how to switch on Parallax here! With so many choices, you might find that the hardest part of creating your website with our new content building tools is trying to decide which blocks you want to use! A block, for example, could be some text and a photo, a gallery, a contact form, a map, a video, and loads more. There are many great variants of all the different block types and each of these can be visually customised to suit your design. When editing a Content Page, you simply click the ‘+’ icon on the bottom-left of your screen, and then choose from blocks ranging between simple text blocks to adding a Google Map or Video to your site. They’re all broken down into categories too so you can easily find the block you need. The Image Blocks within the new content building tools give you more control and flexibility over how they look. Best of all, you can easily control the size and ratio of your images to give your website a clean, uniformed look. When using any of our Image blocks, you can choose between a range of different image ratios to make sure that all of your images are the same size across the page. All you need to do is simply hover over the image whilst in Edit Mode and select the ‘Aspect Ratio’ option. Check out our Image Settings Help Guide to find out more! You can adjust the padding, or the spacing, on the majority of blocks, and this really gives you the freedom to build your content exactly how you want to. Adding space around a photo or testimonial can really make them stand out - don’t be afraid of using a bit of white space! Aside from giving you more flexibility over the design and how your finished website will look, it also allows you to create space around your content. This has a number of visual benefits, including making it easier for your visitors to see and engage with you, highlighting your call to actions, and acting as a separator between different sections. Having control over the spacing of individual content blocks and the elements within them can really give your visitors a clear view around your website. To do this, select the ‘Block Settings’ option on the right-hand side of the block in question and choose your padding options. You can learn more about Padding in this Help Guide. 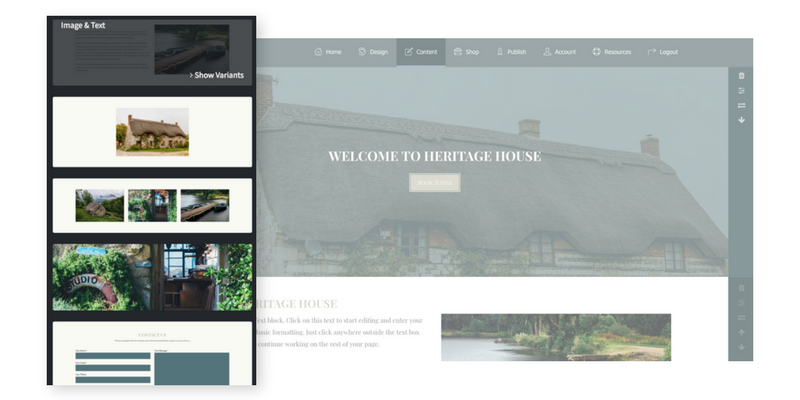 Our design team have worked hard to build a whole new range of templates that have you, our users, in mind. They’ve considered everything from industries and popular colour schemes to typography and layout. The templates are, however, just a starting point - if you love everything about one of our templates, except one particular colour or the font, you can change this from within your Design Studio. Think of the templates as the framework for you to build your brand into, whether it’s the colours, fonts, header or footer, they can all be customised to fit exactly what you’re looking for. Everything we’ve listed in this blog is possible with our new templates and new content building tools. All the templates we make are fully mobile friendly and responsive so they work well on any device that your website is viewed on and are great for any type of business. 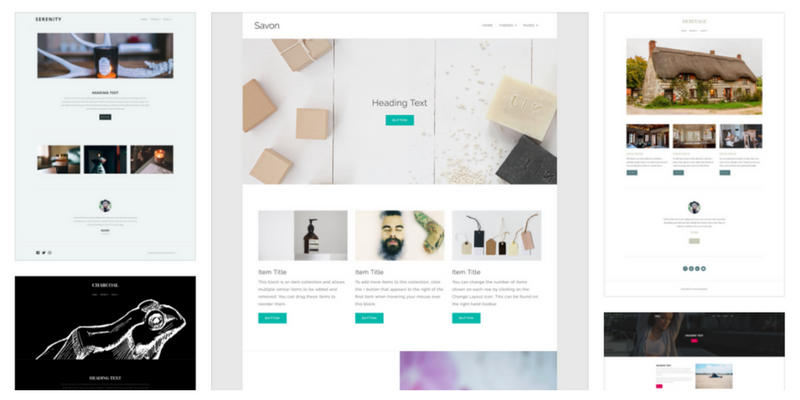 Find out more about our brand new ecommerce templates. We really hope that you’ve enjoyed hearing about all of our new features and we would love to see you try them out yourselves. Let us know in the comments below which feature is your favourite and post a link to your website so we can see them in action! If you want to know more about any of the new tools or templates, you can always get in touch with your Account Manager.